‘Tis the season for resolutions. The tradition of making a New Year resolution can be a useful one for cultivating the kinds of wholesome habits that the Buddha recommended (generosity, compassion, mindfulness… etc.). Here’s a collection of habit-building tips that can stop any good intentions crashing and burning by the end of January 2017. Merry Christmas everyone! I love the above quote. I don’t suppose the writer had Buddhism in mind when he made this observation, but for me it sums up what I believe to be the Buddha’s purpose in teaching the Dhamma – to enable us all to overcome self-created suffering by cultivating skillful mental, verbal, and bodily actions (kammas). Eventually even our healthy sense of self will no longer be needed because we’ll have realised the Buddha’s three characteristics of existence – impermanent (anicca), unsatisfying (dukkha), and ownerless (anatta); at this point we no longer create suffering because all of our actions are aligned with reality and our attitude of universal compassion, friendliness, joyful appreciation, and equanimity, is indomitable. However, until that happy day we’re always likely to create suffering for ourselves and others. We need therefore a positive self image and skillful behaviours that require little if any conscious effort to perform. 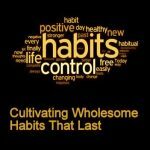 We’re less likely to suffer if we can build appropriate wholesome habits that affirm rather than contradict our self image. It’s pretty common knowledge that ‘not-self’ is a core teaching of the Buddha, and so it may seem wrong for me to be talking about creating a self identity that’s ‘healthy’ or ‘ideal’ or otherwise. However, as far as I’m aware ‘not-self’ doesn’t mean ‘no-self’. Moreover, I very much doubt that ‘no-self’ is the actual experience of people who’re neither brain damaged, dreaming, blinded by dogma, drunk on intoxicants, experimenting with jhanas, nor doing anything else that might trigger hallucinations. Now, if we want to get on the path to nibbana or freedom from suffering as the Buddha advises, we need to drop unskillful behaviours and replace them with wholesome new alternatives, and for that we need to start believing new things about ourselves – preferably things that are based upon reliable observations and experiences. Since Darwin, the popular stereotype of humanity has been one of a globally dominant tribal species composed of fiercely aggressive individuals all genetically programmed for a self-serving life of reproduction and pleasure seeking. I suppose it’s understandable given that many have us were born in one of the bloodiest centuries in recorded human history. But this narrative is hardly conducive to peace and goodwill, is it? 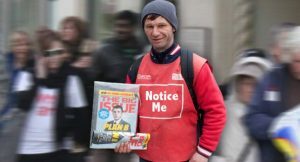 Yet it’s what we’re being asked to believe when media corporations run popular science stories about our evolutionary ‘hard-wiring’ for conflicting behaviours like altruism and greed, for example, and more often than not there’ll be a proper neuroscientist somewhere pouring cold water on them. For me personally, the most insightful view of human nature is contained within the Four Noble Truths Sutta that the Buddha taught around 2500 years ago. When the Buddha is explaining the arising and cessation of dukkha, and the practice that puts an end to dukkha, essentially he’s viewing humanity as a co-operative of interdependent beings with a tendency for creating suffering (by clinging to delusions) but capable nonetheless of attaining freedom from suffering (by developing morality, concentration, and wisdom). It seems to me that we’ll be more likely to cultivate the kinds of wholesome habits that the Buddha recommended (generosity, compassion, mindfulness… etc.) if we can align our own self-identity to his realistic-optimist narrative of humanity. How we actually go about doing this is something I’ll be addressing in the next section. I have to confess that most of my habits were acquired years ago and they developed without me giving much thought to them. Since making my decision to follow the Dhamma, however, I’ve been striving to cultivate wholesome habits and to gradually implement lifestyle changes in order to make simple conscious living more possible. To this end I’ve consulted numerous sources of information, but the above quote serves as a good a nutshell explanation for what needs to happen if we’re going to do this kind of work successfully. Just so we better understand what identity-based goals, performance-based goals, and appearance-based goals are, let’s imagine that we’re working on developing our habit of generosity. We can say that our sense of generosity (“I always give to people in need.”) is our identity-based goal. If we’re aiming to do charitable works (“I help out at the youth club two evenings a week.”) that’d be our performance-based goal. If we’re honest we’d like our efforts to be recognised and appreciated by others (“Thanks, you’ve made a real difference to the community.”) and that’d be our appearance-based goal. According to Clear, we’re more likely to achieve results when we focus on internal identity goals rather than external performance or appearance goals. If we want to establish a new behaviour then we should focus on becoming someone who believes they’ll get it done. Our intentional actions are powered primarily by the belief that it’s possible to do them, so if we lack the fuel of conviction it’s unlikely that strength of will or even sticks and carrots will propel us on towards the far shore of attainment. So, with regard to developing generosity, we need to believe in our self-image of a moral and generous person, and performing small acts of kindness on a regular basis is by far the most reliable way of sustaining that belief. It doesn’t matter much what we choose to do – we can be cheering our co-workers with cups of tea or coffee, helping the homeless by buying copies of the Big Issue, volunteering to assist in a charity shop on Saturdays, or anything else that’s appropriate and doable and requires some kind of meaningful sacrifice. The important thing is that we keep on repeating these small kindnesses to keep our sense of generosity and our actual performances in alignment, because we’ll be suffering whenever gaps or contradictions or discrepancies start showing. 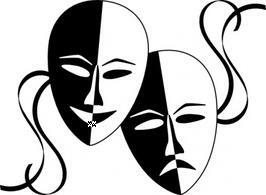 We tend to suffer a lot when we’re forced to admit that we’re slacking, or we no longer believe our own publicity. For the generosity habit to stick we therefore need to make it an automatic behaviour, because relying on motivation or willpower will fail if we’re distracted or we’re simply not in the mood. The effort required can be daunting if we focus on the end results, but we’re more likely to make our chosen habit stick if we commit to a smaller manageable step. For example, if we want to make a habit of meditating daily we should commit to meditating for just ten minutes to begin with. If we want to slim down, we should start our healthier eating habit with a daily commitment to cooking just one meal using fresh ingredients instead of eating out or relying on processed/packaged foods. If we want to write a novel we should commit to writing just one paragraph a day. Committing to these kinds of baby steps isn’t so hard – we’ll probably do them quite easily, and chances are we won’t just stop there we’ll carry on and do more than we initially intended doing. Committing to small baby steps is a good way to ensure that we do the work that needs to be done over and over until the new habit sticks. 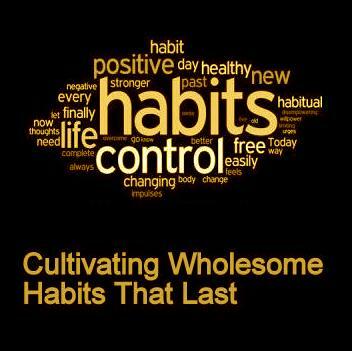 Focus upon cultivating just one new habit. If we try to develop two or more new habits together we’ll most likely fail to establish any of them. For example, when trying to lose excess weight it’s very tempting to embark upon a crash diet and a punishing exercise regime only to feel bored and frustrated and ready to throw in the towel soon afterwards. Not only are we spreading our willpower too thinly, but in addition to cultivating new behaviour patterns we need of course to be getting on with the rest of our life and it all takes time and energy. So, we should have patience and concentrate on building just one new habit until it becomes an established part of our character. Then we can work on developing another new habit. A habit develops from repetitive behaviour: the more times we repeat a behaviour the more likely it’ll become habitual. A month is probably the minimum length of time for any new habit to become established, but in any case it’s a convenient yardstick for measuring progress. For example, if we start daily meditation we might reasonably expect after 30 days to notice some improvement in our ability to sit still and follow the breath for 10 minutes. After thirty days of working out or healthier eating we’d hope to see some evidence of fat reduction when looking in the mirror. Some new habits will obviously take up more of our time and energy than others. A lot will depend upon our personal circumstances as well as the type of new habit we’re trying to build. To establish the new habit, we need to commit as much time and energy as we can consistently apply, for as long as it takes. Attach the new habit to one that’s already established. Myself, I found it quite easy to establish a morning meditation practice. I was able to do morning meditation because I was already in the habit getting up as soon as my eyes opened instead of wasting time snoozing in bed. By choosing to meditate immediately on waking each morning I was attaching the new habit (morning meditation) to an old established habit (getting up immediately on waking). I made morning meditation my priority first action on waking, and no matter what time I awaken nowadays I’ll almost always choose to meditate before doing anything else. There’s always the possibility that changing conditions will stop us following through on our commitment to the new habit we’re cultivating. Lack of time, illness or injury, adverse weather, limited space, or reduced finances, are typical obstacles that’ll derail our good intentions if we don’t anticipate and plan for them. The best defence is to use the baby step approach I’ve already described, because that way if we do get blocked by circumstances we’re still likely to do something rather than do nothing. Having said all that, if the new habit just isn’t forming then we need to identify what’s stopping us getting it done. Whenever we fail to honour our commitment we should note exactly what happened. Were we feeling tired or anxious or bored? Were we distracted by the TV or did something else grab our attention? Were we detained or just reluctant to leave someone? Whatever it was that stopped us, we must try not to let it happen again because we don’t want to be establishing a habit that’s counter to the one we’re trying to establish. An occasional lapse here and there isn’t going to matter a great deal in the long-run, but if someone or something keeps getting in the way of the task we’ve set ourselves then we need to take evasive action to avoid getting stopped permanently. We can incentivise our efforts by declaring our intentions to others and asking for feedback. Knowing that our trusted friends, colleagues, and family members, are monitoring our progress will serve as a good motivator and keep us on track. I realise of course this tactic will sound dubious to anyone who believes we should be immune to other people’s criticism. Certainly the Buddha advises us to know our own mind and not be unduly swayed by public opinion. But the opinions of other people mattered enough for the Buddha to instigate rules specifically intended to preserve the monks’ reputation as ‘worthy of gifts, worthy of hospitality, worthy of offerings, worthy of respect…’ and to stop any criticism the laity might otherwise make against the Sangha. The truth is, most of us generally do care what others think of us because we know that what they’re thinking influences how they relate to us. We’re more likely to try harder when we know we’re being observed because we intuitively know it’s important that others think well of us. It’s important to recognise and reward any progress made, because whether we realise it or not the expectation of being rewarded has driven us from the moment we were born to repeat many kinds of behaviours over and over until they became habitual, and we can utilise this natural process to our advantage when we’re consciously trying to build a new habit. So we should treat ourselves by doing something we love whenever we reach or surpass our target. It doesn’t really matter what reward we choose so long as it brings some harmless fun to our routine and helps us to stick with it. There’s often a gap between how we see ourselves and how we’re perceived by others. If we want to stop suffering we need a healthy sense of self and we need to build appropriate wholesome habits that will affirm rather than contradict that self image. Forming a new habit isn’t so hard. For example, I recently managed to shed 14 lbs of excess fat in just three months by becoming someone who eats more healthily and moves around a lot. The trick is to believe we’re the type of person who’ll get it done and prove it by repeating an appropriate small step every day for at least one month. This identity-based approach to building new habits works much better than simply relying on motivation, willpower, or sticks and carrots. ‘Watch Your Thoughts, They Become Words; Watch Your Words, They Become Actions… Ralph Waldo Emerson? Lao Tzu? Frank Outlaw? Gautama Buddha? Bishop Beckwaith? Father of Margaret Thatcher?’ by Garson O’Toole. Quote Investigator, 10 January 2013. See for example – ‘Selves & Not-self: The Buddhist Teaching on Anatta’ by Thanissaro Bhikkhu. Access to Insight (Legacy Edition), 30 November 2013. ‘Identity-Based Habits: How to Actually Stick to Your Goals This Year’ by James Clear, 2016. 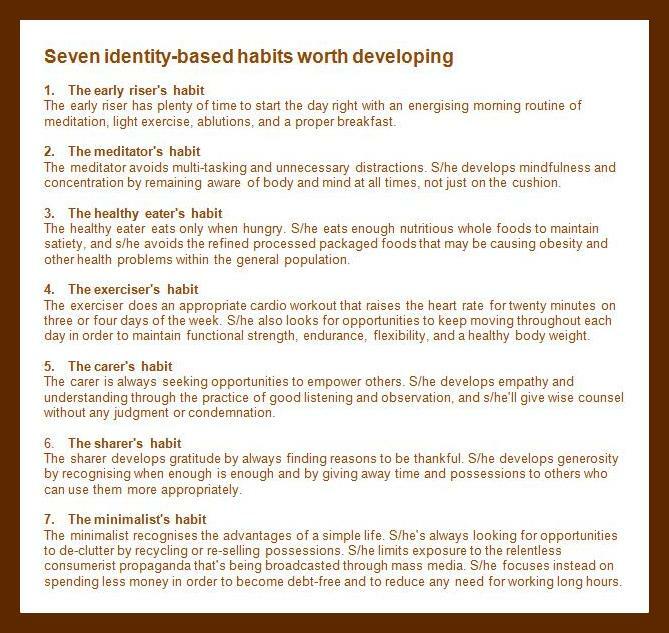 ‘How to Form a New Habit (in 8 Easy Steps)’ by S.J. Scott, Develop Good Habits, 2016. This entry was posted in Commentary and tagged awareness, kamma, mindfulness, not self, self, wholesome habits. Bookmark the permalink.